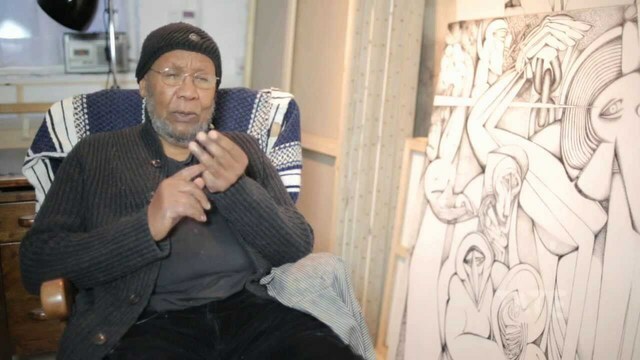 The first Tate Modern exhibition dedicated to African Modernism traces the life and work of Ibrahim El-Salahi. This major retrospective brings together 100 works from across more than five decades of his international career. The exhibition highlights one of the most significant figures in African and Arab Modernism and reveals his place in the context of a broader, global art history. The exhibition outlines the artist’s personal journey, beginning in Sudan in the 1950’s and followed by his international schooling at the Slade School in London. After a period of research and self-discovery, he returned to Sudan in 1957. There, he established a new Sudanese visual vocabulary, which arose from his own pioneering integration of Islamic, African, Arab and Western artistic traditions. El-Salahi lived in Qatar before settling in England in the 1990s. His recent paintings reflect his joy for life, his deep spiritual faith, and a profound recognition of his place in the world. Ibrahim El-Salahi: A Visionary Modernist is organised by the Museum for African Art, New York, in association with Tate Modern, London. The exhibition is curated by Salah M. Hassan, Goldwin Smith Professor, Cornell University. The presentation at Tate Modern is curated in collaboration with Elvira Dyangani Ose, Curator, International Art, Supported by Guaranty Trust Bank Plc. The exhibition first opened at the Sharjah Art Museum in May 2012 and travelled to the Katara Cultural Village Foundation, Doha, Qatar in October 2012. An illustrated catalogue accompanies the exhibition, edited by Salah M Hassan with contributions by Sarah Adams, Ulli Beier, Iftikhar Dadi, Hassan Musa and Chika Okeke-Agulu, as well as special texts by El-Salahi.